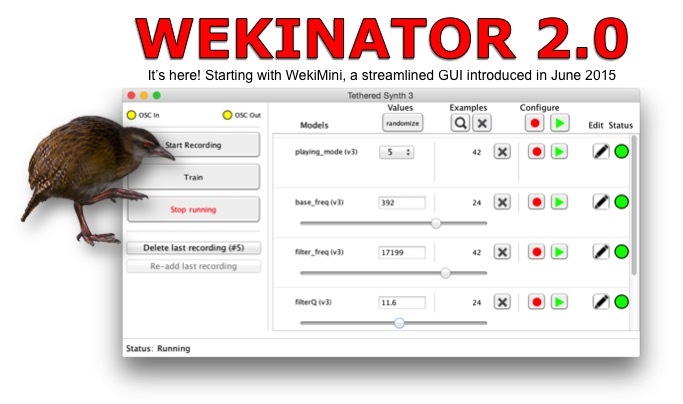 The Wekinator is free, open source software originally created in 2009 by Rebecca Fiebrink. It allows anyone to use machine learning to build new musical instruments, gestural game controllers, computer vision or computer listening systems, and more. The Wekinator allows users to build new interactive systems by demonstrating human actions and computer responses, instead of writing programming code. Create mappings between gesture and computer sounds. Control a drum machine using your webcam! Play Ableton using a Kinect! Control interactive visual environments created in Processing, OpenFrameworks, or Quartz Composer, or game engines like Unity, using gestures sensed from webcam, Kinect, Arduino, etc. Build classifiers to detect which gesture a user is performing. Use the identified gesture to control the computer or to inform the user how he’s doing. Detect instrument, genre, pitch, rhythm, etc. of audio coming into the mic, and use this to control computer audio, visuals, etc.